Scenario: You receive a pdf or jpeg by mail and upon reflection you find that yellow is too yellow, as green is half gray or red is too bright. Problem: You have only the final file and therefore only the possibility to set the color through your printer driver. Result: You will be charged as saturation, brightness, contrast or the "high" quality of your document but not the actual effect you want to give. 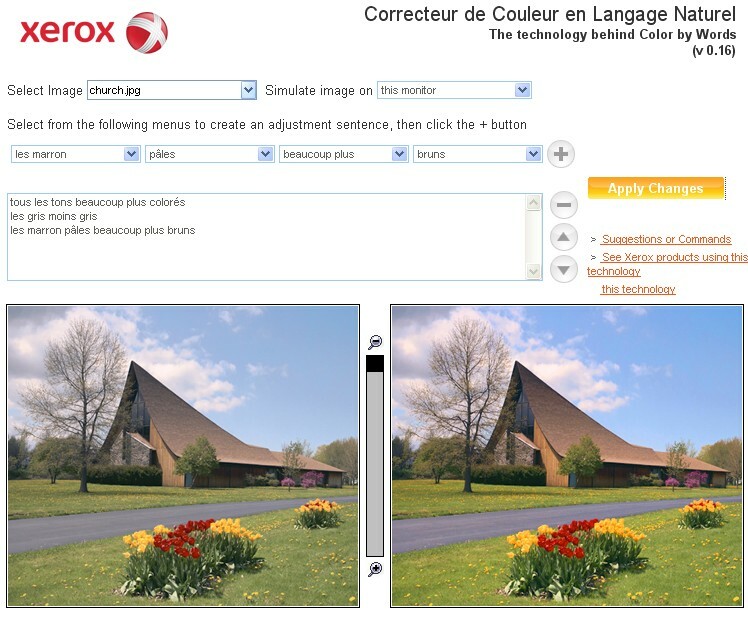 Scientists at Xerox have wanted to upgrade to those who, without any jargon, find a visual that whites are too "white", whose yellow is not quite "live" or whose colors are "not enough colored "by creating the Natural Language Color (color corrector in natural language) or how to adjust the color on certain areas of an image using simple sentences. No need to go through Photoshop and other specialist software, the application called "Color by Words" allows you to adjust each color of an image in a simple and intuitive way. Note that this application is already available on the new Phaser 7500 printer which came out this year!